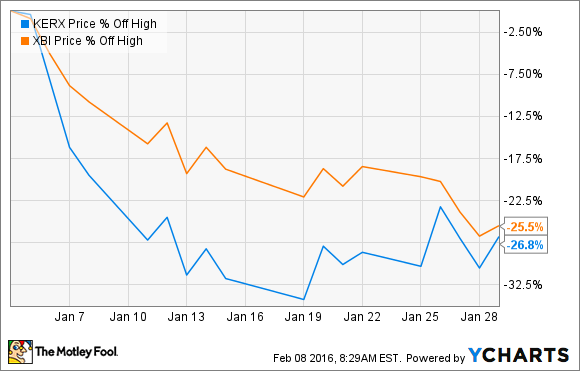 The one drug biopharma got caught up in January's biotech melt down. What: Shares of Keryx Biopharmaceuticals (NASDAQ:KERX), a renal disease-focused biopharmaceutical company, dropped more than 26% in the month of January, according to data from S&P Global Market Intelligence. So what: There wasn't any news released during the month to justify the huge sell-off, so it appears that Keryx's stock simply got caught up in the general biotech beatdown. A look at Keryx's stock during the month when compared to the SDPR S&P Biotech ETF (NYSEMKT:XBI), itself an ETF that holds a few dozen biotechnology stocks, is telling. Now what: While the company didn't have any new information to share, its management team did give a presentation at the J.P. Morgan Healthcare Conference where it outlined its growth strategy for the year ahead. Management also confirmed that its previously announced sales force expansion has been completed. It now has 95 representatives targeting 5,000 prescribing physicians with increased frequency, which the company believes should help to drive more demand for Auryxia. In addition, it has successfully expanded the reimbursement landscape for Auryxia, which was a major barrier to early adoption. Across the pond, Keryx has still not yet launched Fexeric -- Auryxia's European brand name -- as it is still actively looking for a partner in the region. Keryx has a number of catalysts coming in 2016 that could help its stock recover from a dreadful 2015. But, given that its near-term future is tied directly to the success of Auryxia, the company is likely to remain a very high-risk stock and should only be held by investors with a strong stomach for risk.